I seem to have spent most of my sketching time in South Carolina painting around the perimeter of the salt marsh on James Island. 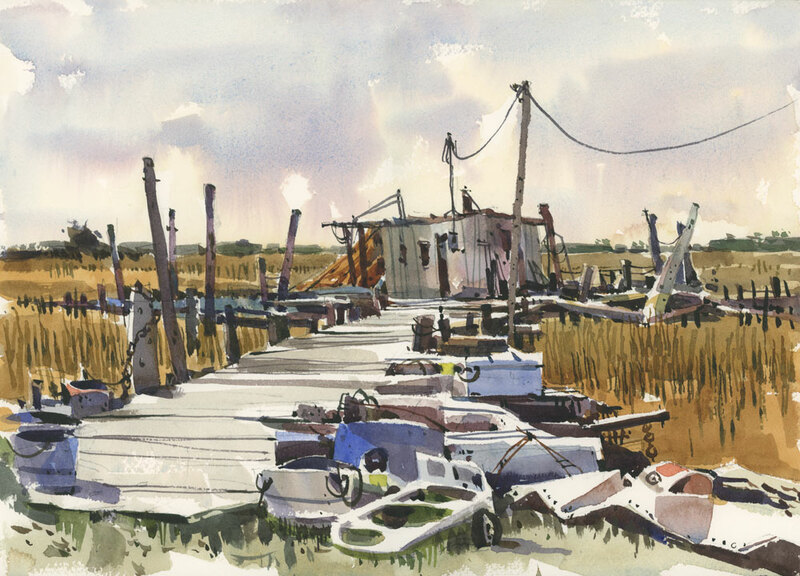 When I’m sketching in the city there are no open views like this, so I guess the expanse of it was quite appealing — the great waves of dry marsh grass, scattered boats moving up and down with the tides, and of course the low-flying pelicans and herons. Backman Seafood Company must have been quite a special spot back when the fresh shrimp was coming in off the boats, but there doesn’t seem to be much going on there these days. Off to the right of what I sketched is a boat belonging to the Backmans that was beached after Hurricane Hugo. The seafood shop is closed up tight and the pier seems abandoned. The only info I could find was an interesting article in the Post & Courier about the death of Thomas Backman Jr. in 2015. I’d love to hear more if anyone know what happened to this place. Sketched on Arches 140 lb cold press paper, 10″ x 14″. Love your paintings, as always, Shari. I am working on building up courage to take your online class. Which one should I start? You have an amazing sense of color. I would love to hear more about how you think about color and the palette you select for a particular image. An individual color, like the blue here, looks stunning, but I am sure the context and combination with other colors has much to do with that. Hi Jan. This scene didn’t have much colour in it to begin with so my choice of palette is really within the earth tones. Lots of Ochre, Raw Sienna and Burnt Sienna. But to contrast that I used a cool complement which is why I picked the blues for the foreground objects. I wanted the contrast also between natural and manufactured objects like all the junk along the pier. I don’t really think about this stuff that much when I am painting but now that I am answering your question I can see that decisions were certainly made along the way. So thanks for asking this! Gorgeous work, Shari! I feel like I’m there. Beautiful work Shari! Was this done with brush only? Many thanks Liliane! For a complex scene like this I have to draw in pencil first. If you can zoom in on the image you will certainly see the pencil marks. Hi Lisa. Thanks so much. I would love to know more. And sorry we didn’t get to see each other this time. I will be back. I love South Carolina! Wow, this is a stunner! Gorgeous as usual. 🙂 Hope you are having lots of fun and enjoying the warmer weather. thanks Janine. I am back now where it is really cold in Montreal too. No break from the weather this year. Cold on holiday and cold at home but it was still nice to get away. Lovely, I don’t know how you do it. Next to this new painting was an advertisement for your book, Mostly Montreal. There was the painting of a typical alley right next to this new one. I have to say that my heart or spirit took a little leap when I looked at the alley scene. I wonder if it’s because I love Montreal or if it’s because you love Montreal. Maybe love shows through a painting or is it in the eye of the beholder? I am cuckoo for any pigment you drop in Lachine too. I was wondering if you change your palette much or the way that you use it, when not Montreal. I was wondering if a person masters their palette for one place or subject? Just some musings…. Good musings Stephanie. I hope my love for Montreal comes through in my work. I grew up here but when I started sketching I discovered so many places and I love my city even more now. But I love a lot of places. I think if you stay in a place long enough and have time to really experience the people as well as what you see when you stray from the crowded places, you will find a lot of beauty. As for my palette, I do change the colours somewhat when I travel. When I painted the National Parks in Utah I brought a lot of red earth colours along; when I was in Costa Rica I added more yellow and turquoise and pink. I brought more greens for Ireland, etc. But the basic dozen or so colours stay the same. Thanks for writing! It is sad to think that this spot had such life to it at one point. Nevertheless, I have a fondness for places that are run-down and need a little love. They have more charm and interest than something neat and tidy. You did a fabulous job on this with the rickety boardwalk leading us to the shack. I always love when an artist breaks the rules and shows us that the center of interest can be in the center of the page! Shari, I did find this about the seafood company. Apparently they were hit hard by Hurricane Hugo back in 1989, but there was a review of the shop from last year so it was still open then. But then there was something added further down on the page that said it is permanently closed at this location. The view behind Backman’s Seafood is reason enough to take a right off Folly Road on Sol Legare and visit this little seafood shack that overlooks a beautiful marsh and pier. The back lot of Backman’s has been a hangout for friends and family for decades. Inside the seafood store, employees munch on fresh seafood while watching game shows in the kitchen beside the seafood case. They cook breakfast every day on that stove. Backman’s boat, the Enterprise, stocks the shop with local fish. They specialize in fresh fish and occasionally have crabmeat. You’ll have a hard time finding anything there that costs more than $7. Backman’s also sells pickled pigs’ feet and pickled sausage fermenting in plastic barrels. A little-known fact: The boat that’s beached on the side of Folly Road belongs to the Backmans. It became a landmark after it was washed away by Hurricane Hugo. Shari: lovely work, as always. Seems you got a lot of info about the area. This looks so typical. Farther up the coast on the Outer Banks of North Carolina you would find much similar sights. You might enjoy Okracoke Island which may only be accessed by ferry. I have been drawing and painting on the Outer Banks for more than 50 years. In Florida, there is something similar along the gulf coast at a spot called Cedar Key. Going up to the Outer Banks again in Sept, I hope….. These sound like wonderful spots Lee. I know from your drawings that you like drawing salt marshes too. I have never heard of either of these places but I will be sure to look them up. It sounds like the Outer Banks are for you what Cape Ann if for me. I have started an annual tradition of drawing there, and for me it is like nowhere else. Thanks! Shari, I love the sky! You combine the wet in wet colors so well. I know you say that there are so many unexpected results with watercolor but you seem to get those serendipitous things to work overtime for you. The values in the composition are wonderful and it’s beautiful how you bring the radiance of the sky down to the pier and foreground objects. One more thing; the trees along the horizon are so minimally rendered but visually complete. A very enjoyable composition. Thanks so much Jeff, for your wonderful comments. A good result with the sky has nothing to do with me. It is all in the Raphael brush that just kisses the paper with the lightest touch. If I didn’t have that brush I don’t know what I would do. As for the distant trees, thanks for noticing those. I tried my best to keep the detail in those to a minimum since they were quite far away. It’s easy to get carried away and include too much detail so some restraint was needed. There is tons to learn here.and a big thank you to all the artists who have commented. You are helping me see! They help me see too Holly. Thanks to you as well. Love this scene, you can almost feel the gentle breese coming from the shore and the smell of the salty air. Your sky gives itg a sense of space. What a tranquil spot to paint. It was a tranquil spot Andre. The only problem was that the gentle breeze was colder than expected so I had to paint from inside the car. But I was still happy to be away and not in the snowstorm we had in Montreal!